One of the objections to the hypothesis is that it is likely that there would be pockets of humanity now, in isolated tribes, perhaps, who would not be descended from Adam and so be excluded (with all kinds of racist connotations). In the end, of course, this would be unproveable either way, but would nevertheless be covered by the providence of God. His word, after all, says all men have sinned in Adam, and all men may receive Christ, so we act on that, rather than any other supposition. Still, until the modelling work of Rohde et al. and the Christians since who have examined the maths (especially Joshua Swamidass), nobody even considered that we have might recent universal common ancestors. So we’re still at the stage when support of any kind is useful in changing fixed assumptions. In this case I note a recent news item on, of all things, the domestication of the horse. Received wisdom has been that, although equine species ranged across Europe and Asia, and even the Americas at one time (we’ll exclude the zebra of Africa in this discussion), all domestic horses share a common root, of which the sole living wild descendants were believed to be Przewalski’s horse, from the steppes of Asia and Europe. Now it appears that this is not the case at all, and that Przewalski’s horses are all feral, that is, the descendants rather than the ancestors of the domestic horse. The consequence is that it is now believed that the horse – domesticated only about 5.5 Kyears ago – came from another species or subspecies that is now extinct. This seems surprising, for although the horse was hunted as a food source in prehistoric times, hunting wild horses to extinction, at a time not only of agriculture but of valuing the horse as a useful creature, seems an unlikely scenario. 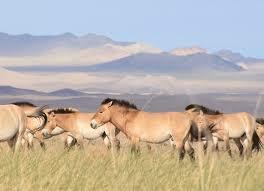 They are not offensive or dangerous creatures, as the many varieties of semi-wild pony even now attest. Even in the intensively-farmed UK, there are separate breeds on Dartmoor, Exmoor and in the New Forest, which although managed and even, in theory, often owned, have always lived more as wild creatures than domestic ones. It would seem, then, that in a way hard to specify with certainty, the entire population of the original wild horses was slowly assimilated into the domestic sphere. Presumably this would include extinctions and habitat loss, the capture of more wild horses and the escape of domesticated ones. Howe’er it came about, though, the result is that now (if the scientists are correct) no ancestors of the domestic horse exist in the wild anywhere in the world, and all are descended from horses bred by people. The same kind of thing is true of the domestic dog, although its association with man is far, far, older. 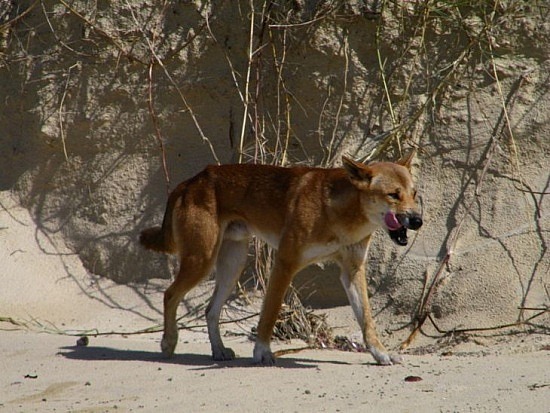 The genetics seems to suggest that all the world’s many varieties of domestic and feral dogs (like the dingo) arose not from the grey wolf with which they may still be crossbred, but from a now extinct sub-species of wolf. Just as with the horse, it is hard to understand why a species that was so successful in its association with us should have become extinct apart from that association, but that’s how it was. There are few cultures that have not possessed dogs – the Inuit had them in the arctic and they were bred in South America, the Polynesians took them even to far-flung New Zealand. They thrive (as scavengers, as well as hunting dogs and, in more refined or effete societies, house-pets) all over the world. And yet the presumably more genetically robust wild species from which they came has entirely disappeared. 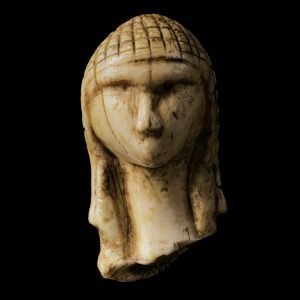 Wild type Pre-Adamic woman? c23K BCE. No longer found. I see here a situation one could compare with the hypothesis that there existed within historical times “non-adamic” people. It would be wrong to call them “wild”, not only because they were cultured, but because it may well be they who are described in Genesis 1 as created in the image of God, depending how one interprets the scope of the creation narrative. But under Genealogical Adam, they were not descended from Adam, and so had not at that time partaken either of Adam’s relationship with God, nor the sin that tragically ensued. So, in contrast to Adam as Homo divinus we might use the term “wild type” in a strictly limited sense. But since identifiable wild types of horse and dog have disappeared entirely from the world over a few millennia, probably mostly from absorbtion into the humanly domesticated stock, it should not appear at all implausible that the two human lines should merge without remainder in a similar way. Not that this is proof, of course – there are still wild jungle fowl believed to be ancestors to the chicken (but has domestic ancestry been fully excluded in their case, I wonder?). Likewise there are, apparently, still wild mouflon from which came domestic sheep. 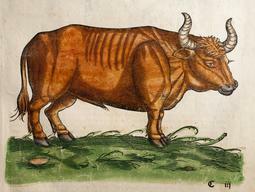 The ancestor of cattle, the aurochs, is extinct, but only within historical memory. But it does seem to be the case that coming into the fold of the human race is often a one-way street. Domesticated type Adamic men – c1940 CE. Still all too common. Why struggle so hard to invent these non Adamic people groups?if Adam is accepted then why not accept, the same bible statements, that he was the first created man and woman from him. In your other human lines were women not created from the mans rib? Possibly your too impressed by these primate claims from evolutionists!? Interesting about horses and dogs. I think its not just the domesticatic horse lineage but all horses that went extinct save for Zebras. Its not understood just how massive was extinction some centuries after the flood. The two humped camel also only survived in mans company. What biblical statements are you referring to? oh come on. its famous and obvious. the bible was written for mankind. It explains the first man being created from dust. not born. then woman was taken from him. Not born. 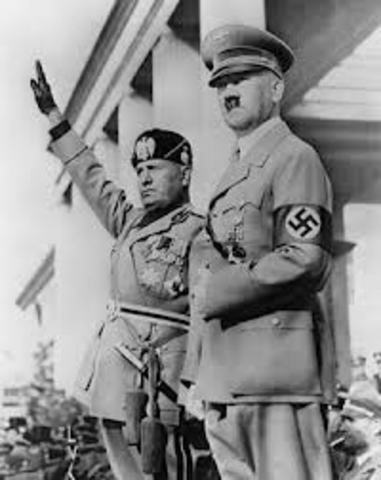 and all mankind comes from these two. There is no mention, or hint, of any other humans or any living humans coming from other then Adam/Eve. Even those who reject the bible as gods word would insist the audience is meant to understand all mankind comes from adam/Eve. any other humanoids is not from the bible allowance. Its evolutionism that invents hominid lineages without any evidence to write home about. It doesn’t say Adam was the FIRST man (except in the sense that Christ is the second man). I understand that this is what people say that scripture says, but what I am asking is “where does scripture itself say that?” I am asking you to give me chapter and verse where it says that. If you cannot, I don’t see how you can claim that it is the biblical position. If you have better scriptural evidence for the opposite view then you lay it out. Come, let us reason together. i watched it and it was not persuasive or close. genesis is clear to readers. Mankind was created by God. Adam was created out of dust. not born. eve was created out of adam. Not born. In them mankind started sin and from them comes jesus to save mankind. In clear context mankind has its origins in this couple and no other humans exist outside of this couple. Unless they were outside the sin/death problem and so never would die. There is no scripture to say in genesis there were other, naked, couples on earth! Its just so wrong what this video/you said its not interesting. Even rejecters of the bible would say its purpose was to explain where mankind came from in a clear understandable way. see all the peopleWEL they came from Adam/eve. You actually didn’t cite any scriptures in your response. You presented no scriptural arguments. Nor did you respond to or address any of the scriptures or arguments presented in the video. You simply repeated the same assertions. Can’t you see that is not an argument? Can’t you see that your strong opinion is not based on what the scriptures themselves say but only what someone has told you they say? You have an opportunity here to learn something, one way or another. If your position is correct, you have a chance to learn WHY you believe the scripture supports that position. If your position turns out NOT to be what the text actually says, you have a chance to align your beliefs with what is actually in the bible. Why not take it? Possibly your too impressed by these primate claims from evolutionists!? No Robert, you’ve not been comprehending what I’ve been writing – it’s study of the text and the theological and narrative structure of the Bible that counts. That said, one thing that the “evolutionists” have going for them is drawing their conclusions from actual evidence, rather that just conjuring up the past out of thin air. “All horses went extinct, except for zebras…” doesn’t come from any scientific evidence, and certainly doesn’t come out of even the most literalist reading of the Bible. But it does seem the best counter-argument to young earth creationism is often the stuff young earth creationists say, which is labour-saving. None at all is presented for humanoid lineages relative to evidence that should be presented. the horse comment is based on actual evidence from the fossil recoprd and living record. the fossils, post flood, show a glorious diversity of horse types and then they are no longer here. None. Except zebras and domestics. the Zebras continue to exist for the same reason all africa kept its great creatures in great numbers. elsewhere the horses went extinct. Except for those tamed by man and probably thye only reason. Its not surprising why there is no wild herds of our domesticatic horses. it would be surprising if they existed. only now they admit they don’t. they tried to say they did exist as you document. The error is corrected. fossil/living all show massive extinction of creatures just prior to mankinds emergence in numbers. yEC is just sharper on these things because we have the bible as a starting presumption. Well, not exactly. It says that as in Adam all die so in Christ will all be made alive.” I believe that is 1 Cor 15:22. Adam was the first stand-in for the race adam, and Christ was the second. That’s also in 1 Cor. 15 for those with eyes to see. Physical descent through natural means is not required to be “in” either Adam or Christ. which goes into great detail on these and other matters. As regarding the main thrust of your article I see your point as far as it goes. I guess all analogies break down at some level of detail but I think what happened with Equs is not what S.J. Swamidass is proposing with G.A. He can say for sure of course. The line of Adam did not replace the rest of humanity (to me the RACE adam) but rather has been mingled with it. SJS is saying there is a trace of Adam in there genealogically even if we can’t detect it genetically. Not so with the horses. The horses were kept into two domesticated lines which survive and the rest of the kind was wiped out. If the domesticated horses had kept getting genes introgressed from wild strains before the wild died out then we would be able to tell. This is not what they say happened. So if, as you suggest in your later paragraphs, the line of Adam comes to dominate the rest of the race of men then we might expect our genes to look very different than what we see. We don’t know Adam’s Y-hap type for example but regardless of what it was there are a large diversity of Y-haps still around, many of which have an estimated date of origin in the distant past long before anyone but Hugh Ross’s projected date for Adam. It is likely Adam was some type of J because that is the most common one in Arabs and Jews and that makes up only a small proportion of the Y-haps out there. But no matter which it was, the line of Adam could not numerically dominate as the domesticated Equs has because no Y-hap is that dominant in humans. The horse story was intended to make one small point only – that a domesticated bloodline can, surprisingly, entirely replace the original population. I don’t think the research indicates that, in the case of the horse, that happened by eradication. The very existence of feral horses in abundance now shows that escapes and interbreeding would have happened in the wild throughout history, and that is far more likely a scenario for loss of the wild type than that it – or the non-wolf – was a marginal species helped on its way to extinction by persecution. Chain of being – still binding us?